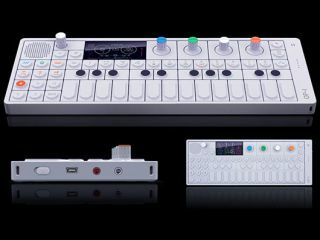 In terms of functionality, the OP-1 is "90% complete"
It's already starred at trade shows and in a high-profile music video, and now we finally know how much Teenage Engineering's OP-1 mini synth/controller is going to cost. According to a Teenage Engineering newsletter, €799 is the projected price, with orders only being taken directly via the company's website. Chip sourcing issues mean that it's not yet clear when the first units will be available, but once these have been resolved, a full production run will start. As for specs, the newsletter confirms the following: "The OP-1 will be shipped with 6 synthesizer engines and 2 sampler types. Pulse was shown at the NAMM show, the other synthesizer engines are DrWave, FM, Phase, String, Digital, Cluster. "Further it will include 8 effects, 3 LFO types and 3 original sequencers. The Mixer section has a dedicated EQ and Drive as well as Master Balance and an additional Master Effect slot. The Sequencers can be matched to the tape speed with a feature called Beat Match. "The Tape [will] also have additional ONE-KEY features added that will be revealed at launch." So there you have it: with any luck, the product that everyone's been talking about since March 2009 might just be with us by Christmas 2010. The issue of whether or not the OP-1 is worth €799 will now be debated, but our suspicion is that there'll be plenty of people in the queue willing to pay for one.